Since 2004, Lift and Access has been a catalyst for positive change for owners and operators of lifting equipment in North America’s construction and rental markets. Through internal analysis and input from the industry, we strive to maintain our equipment-centric focus to advance the state of the lifting equipment industry. 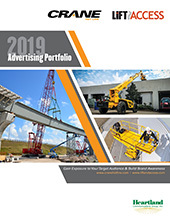 As North America’s most comprehensive lifting equipment magazine, each issue of Lift and Access analyzes new technologies, discusses industry trends, and reviews unique applications. Our coverage goes beyond equipment introductions. It provides an in-depth look at the advanced engineering, components, and ancillary products that further enhance the products’ usage and safety. In addition to construction and equipment rental, Lift and Access extends its mission to the overhead utility market and fleet procurement managers respectively through its Telecom & Utility Construction and Components & Consumables supplements. Both products look deeper into these specific lifting equipment sectors, providing in-depth product information to industry professionals. Reaching more than 25,000 professionals with the print and digital circulation and a targeted bonus distribution for supplement readers, Lift and Access’ comprehensive circulation includes skilled workers of various titles, but they have one thing in common: They select and rent equipment for their facilities and jobsites. Lift and Access recognizes and understands the needs of these equipment buyers and owners as they set out to comprehend the nuances of each crane, aerial lift, and rough-terrain forklift introduced. Our editors rely on their extensive experience with lifting equipment—more than 90 years combined—to offer articles that are both timely and practical to help general and specialty contractors, equipment rental centers, and equipment dealers learn how they can benefit from these machines, components, and accessories. Through the combination of our print magazine, regularly updated website, weekly eNewsletter, digital issues, and live webinars and conferences, there is no faster route to market your products than with Lift and Access.